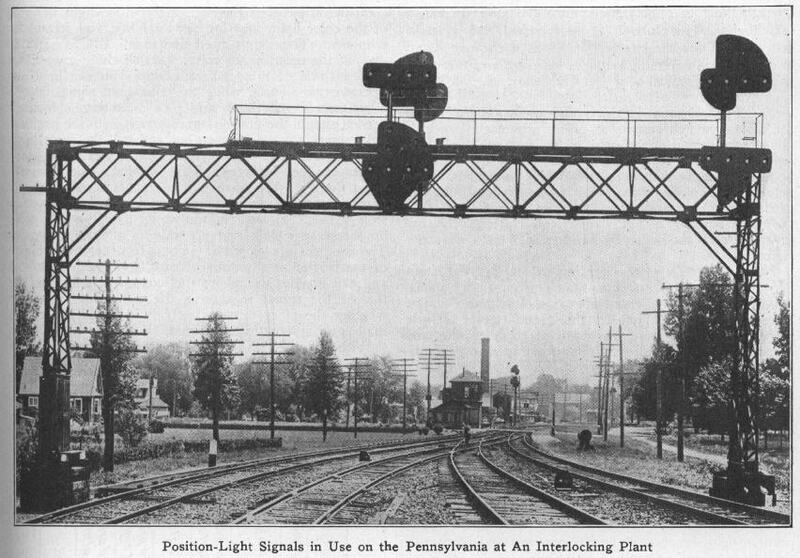 Not really sure what more I have to say about the Pennsylvania Railroad position light signaling system. It is the name of the blog and what I haven't already covered in surveys and news items, it was technically incorporated into NORAC, a signaling system we have already better known. 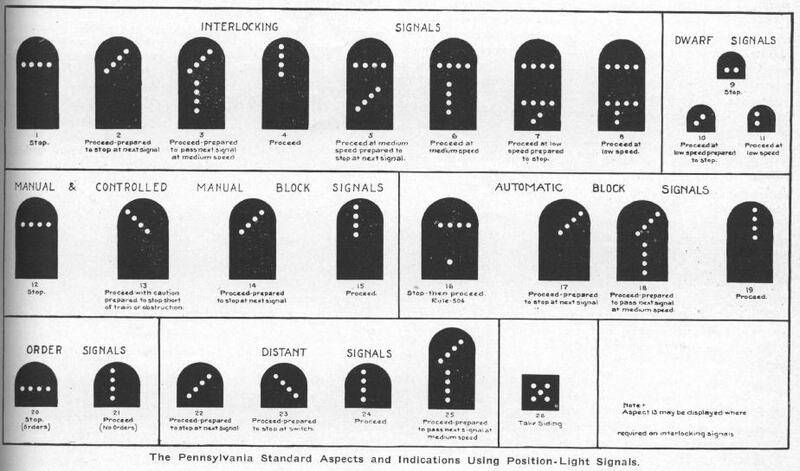 So instead of just going down and describing all the PRR signal indications I am going to take a different approach and look at how the PRR position light signal indication evolved from the initial PRR semaphore indications on which they are ostensibly based. 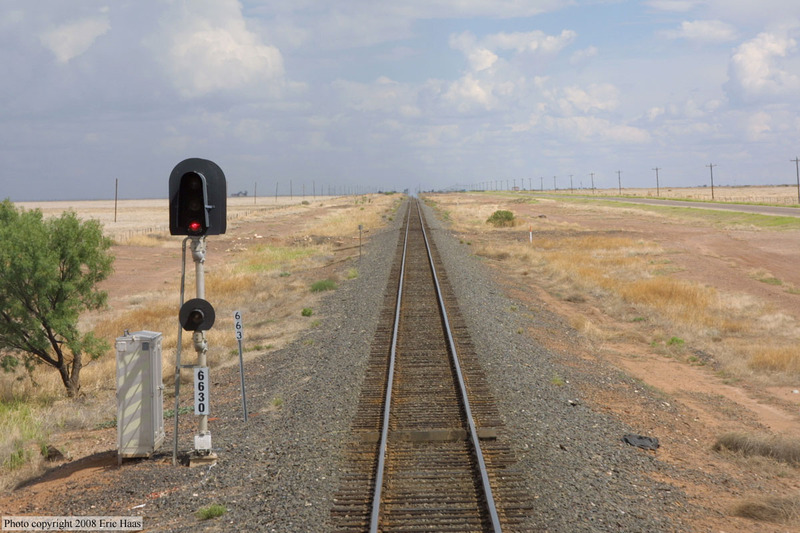 Moreover I will also look at the prototype PRR PL system, known as tombstone signals, as well as later developments such as Limited Speed. 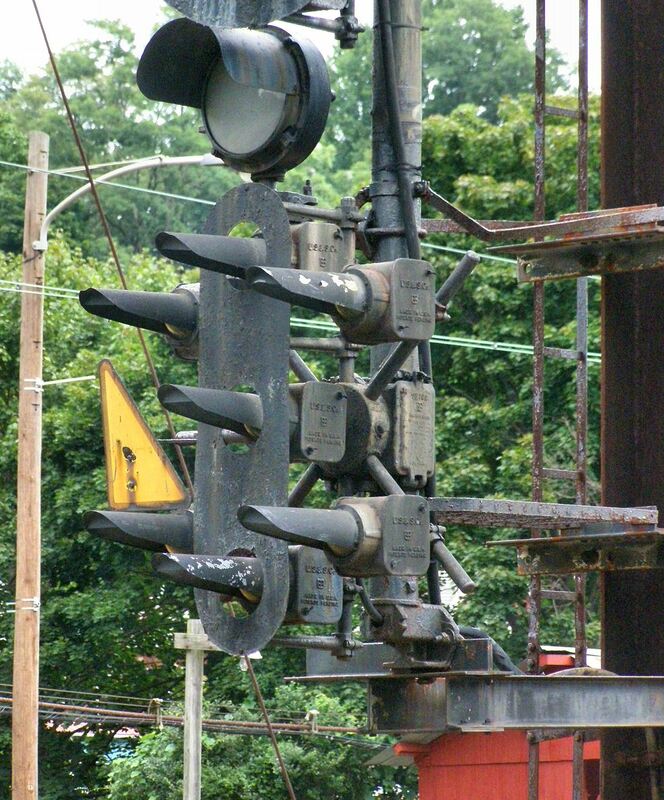 I should first mention that if you are looking for a great technical history on the PRR PL you can find one at railroadsignals.us and there you can learn all about the original 4-lamp position light system, sometimes known as "tombstone signals" due to one of the variations of backing plate. 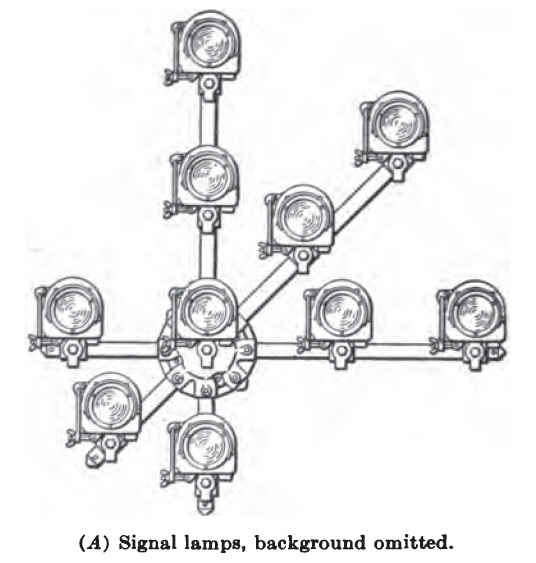 The 4-lamp PL's were an almost literal translation of the semaphore blade positions into lights. 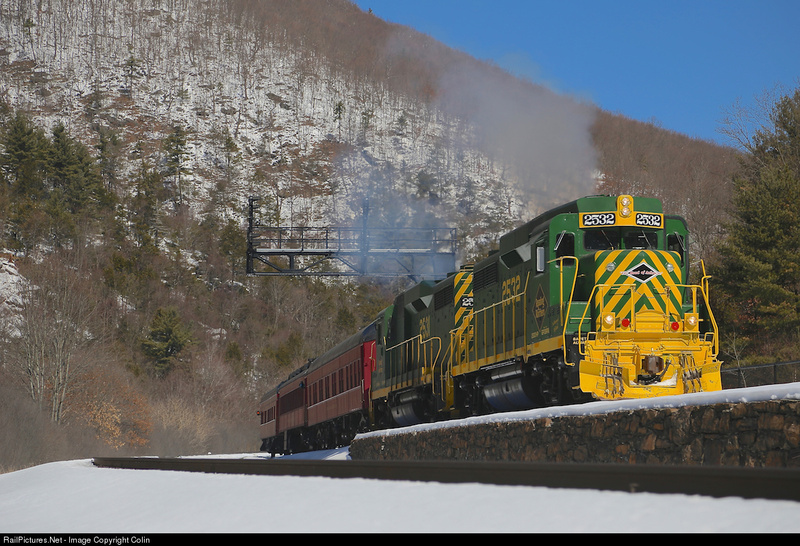 If you are wondering why the PRR didn't just go with using the all color "night" indications, the reason is because reliable high intensity light sources (and mains power) were not yet available yet. Searchlights and position lights could make use of low wattage bulbs that could run for long periods even on battery power. Looking at the chart above we see all of our familiar favorites including / over | approach medium and --- over | Medium Clear, but we also see some interesting deviations from the later system, most significantly --- over / Medium Approach. 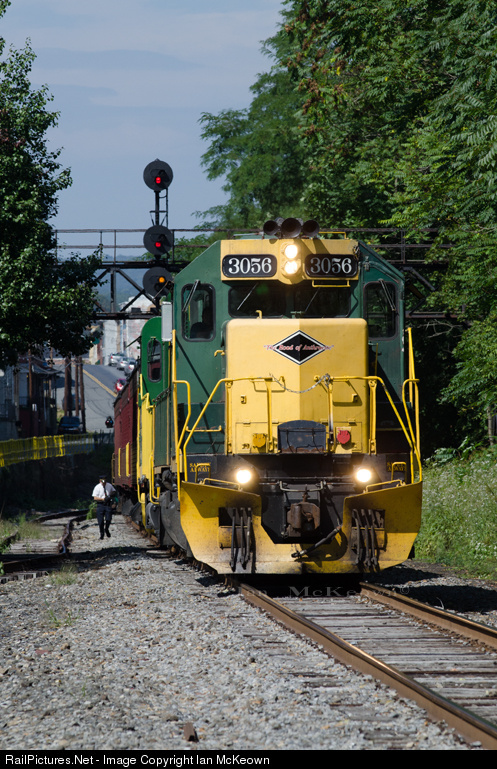 Also, "Slow speed" indications were handled by a little two lamp analogue of a subsidiary signal on a third head. These consisted of a --- over --- over / indication, which I believe is Restricting and a --- over --- over |, which plays the role of a Slow Clear or Slow Approach. 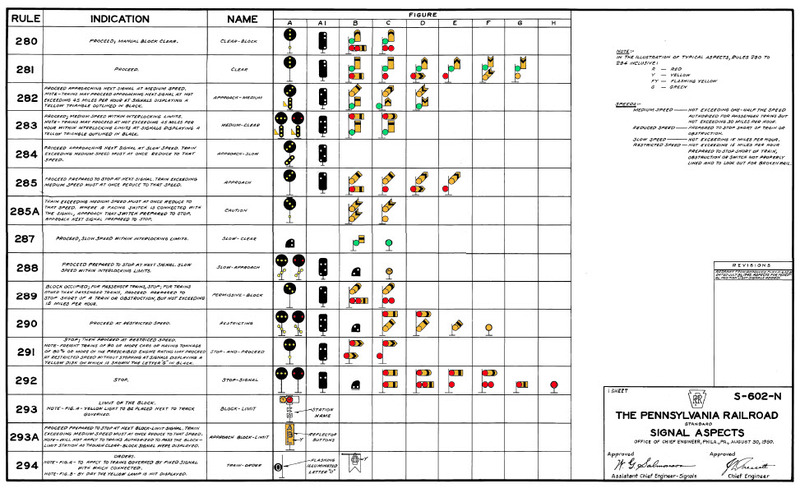 Sorry for the small chart there, but I wanted to show how the 1950 version of the PL system compares with the older semaphore system, still very much still in use at that time at various locations around the vast PRR. One interesting thing is how indications that involved the shape of the semaphore blade (Caution and Permissive Block) had to make use of the upper head \ indication. We can also see why the Semaphore system had no Approach Slow as Y/Y was the night indication for Caution. Prototype PL's, trying so hard for a third head. From the 1950 chart we can see how PRR used an exclusively 2 head Semaphore system, which in turn lead to the 2-head PL system. The Standard Railroad of the World was not about to go around throwing money at unnecessary signal heads, but as the above picture shows, signal engineers were not unaware that the PRR's use of only two heads presented a few limitations. 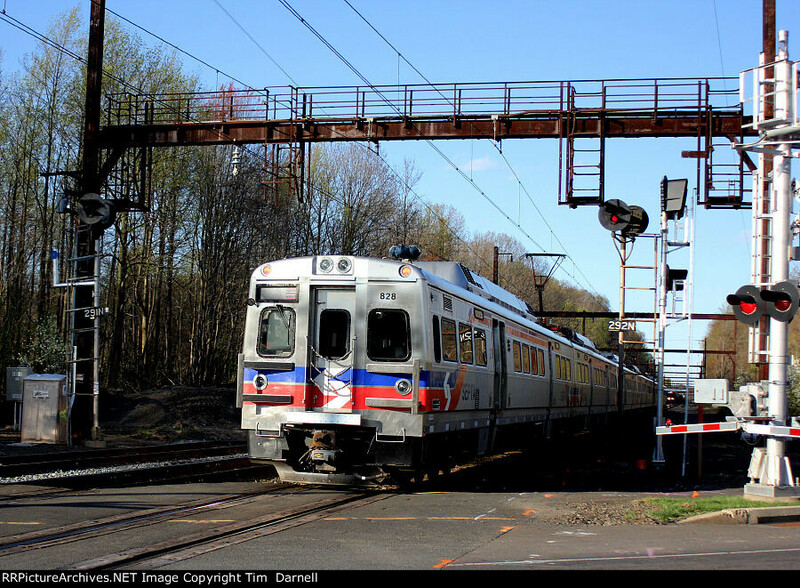 With the subsidiary signal available for slow speed movements, --- over / Medium Approach was an obvious choice since it was not available as a semaphore since R/Y was reserved for Restricting. However when the PRR PL system was finalized with 3-lamps and 2 heads, Medium Approach had to go for a combination of Restricting and Slow Approach for slow speed movements. If you are wondering how one diverged to stop, spend some time on the LIRR as they still use the original PRR system where one diverges over Approach after first passing Approach Medium with the theory being Approach Medium gets you down to Medium Speed and Approach requires traveling at Medium Speed. 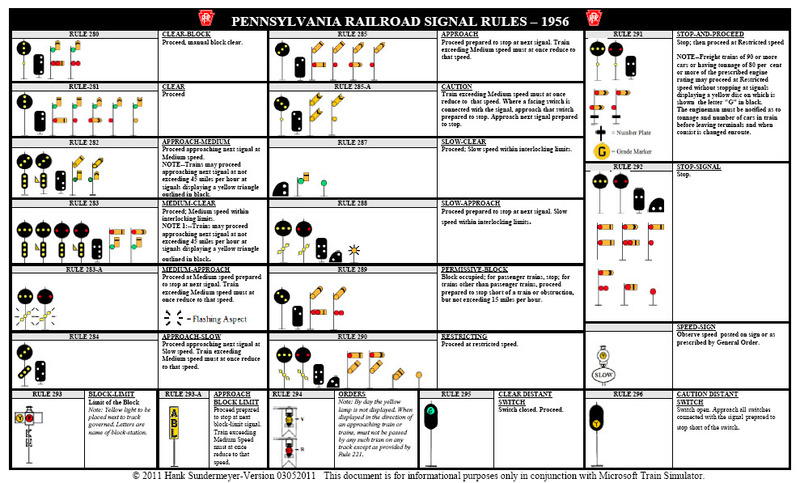 Also making its appearance in the 1950 version of the PRR PL system was the Limited Speed triangle, which allowed for higher speed turnouts (45mph vs 30mph) without having to spend more than 30 cents on a signaling upgrade. Limited speed turnouts started seeing wider use in the 1930;s and 40's in the electrified region where the higher performance of electric locomotives and multi-track main lines made efficient crossing over more of a necessity. I should also note at this time that the ever stingy PRR applied a backing plate only to the | on the lower head because it was thought that any Engineer approaching a signal at Restricting or Slow Approach, would be going slow enough to see the indication even in bright sunlight. 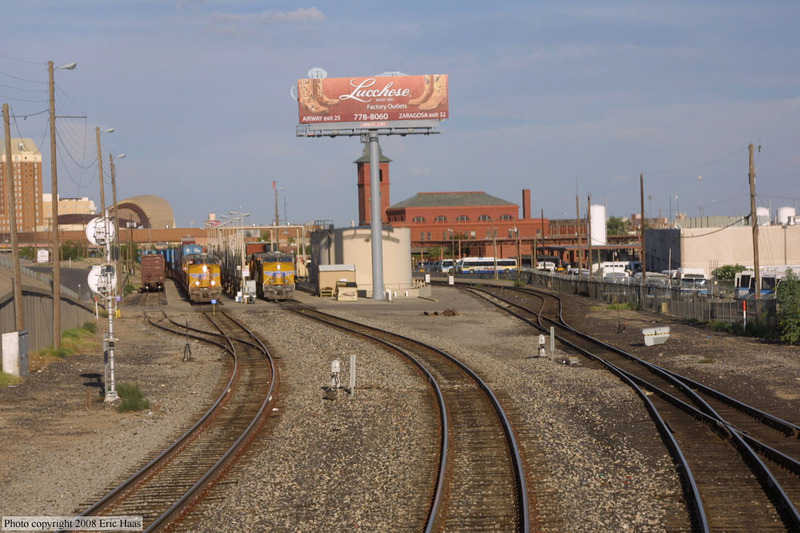 Well I just returned from my annual cross-country Amtrak trip and this year's target was the Sunset Limited running eastbound between Los Angeles and New Orleans. Unfortunately, I was unable to take most of my usual photos because Dan Akroyd parked his private car on the rear of my train and blocked most of the usable view. Nevertheless I was able to still observe the state of signaling along this route and if there was a silver lining I really didn't miss much photo wise because almost all the classic signaling has already been removed. Because the scheduled departure for Train 2 is 10pm (and sometimes brought forward to 8pm as was the case with my train) there really wasn't anything to photograph on that leg of the journey anyway. The train used to depart at 3pm so if you want to see the state of the line this YouTube rear-end video before the schedule switch in 2011 will have to suffice. Between LA and Pomona I did happen to spot a couple of surviving searchlight signals, but there were only about 2 or 3 locations. Everything else, including the entirety of the Colton terminal has been re-signaled. 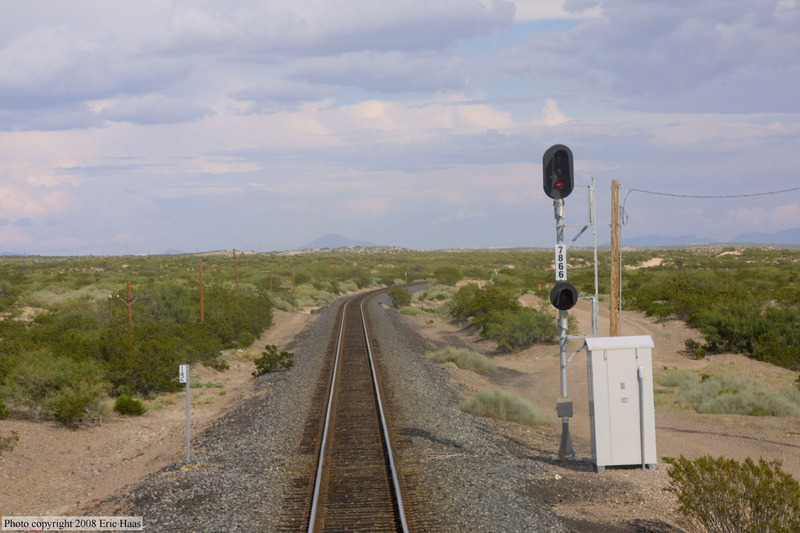 Moving east of Tuscon onto the Lordsburg Sub there are pockets of surviving Southern Pacific style target color light signals, but only in mountainous areas with low track speeds. On the flat desert the route has been completely resignaled for higher speed 50mph turnouts. You can see much of this re-signaled territory documented at redoveryellow.com. The new train timing allows for photographs in the SP zone so that is a plus. These searchlights are no more. While the large El Paso terminal featured two surviving interlocking towers and a number of SP style target signals, all of the searchlight signals have been removed. 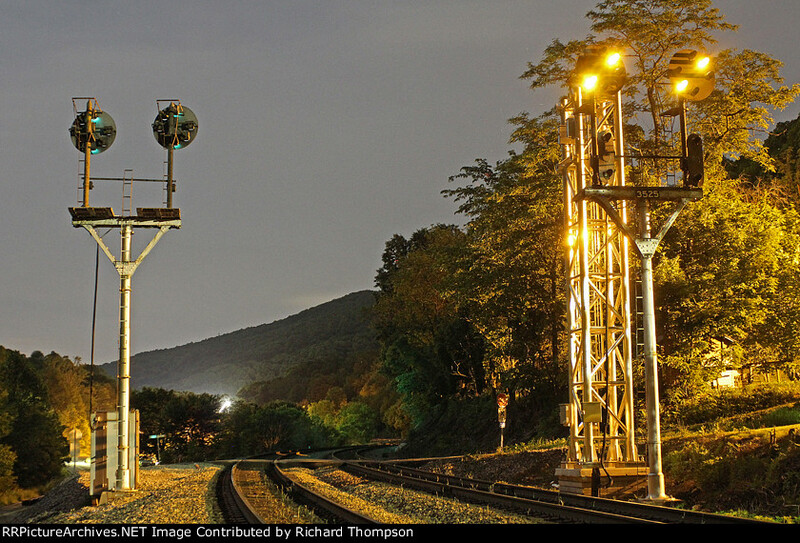 Continuing onto the Sanderson Sub, UP has completed its work in scrubbing the hooded SP signals and searchlights over the entire route to San Antonio. Has become this. No exceptions. Moving onto the Glidden Sub, SP style targets still prevail, but many have been removed at any location that has been modified. Preserved interlocking towers still stand at Flatonia (Tower 3) and Rosenburg (Tower 17) so keep an eye peeled for them. In the Houston Terminal area a few searchlights can still be found, but those on the Glidden Sub will soon fall due to a double track project. On the Terminal Sub, none appeared to be currently threatened, but re-signaling projects are ongoing at a number of junctions previously re-signaled with Darth Vaders so look forward to cheaper LED Darth Vaders in those instances along with multi-interlocking diamond crossing complexes replacing single interlocking complexes. In the Lubbock area the major junctions in town sport a number of searchlight signals along with US&S transit style signals at some of the more complex junctions. Many of those are controlled by the KCS so they might hold on a bit longer. Moving into Louisiana the entire route through and past Lafayette has been re-signaled, however the BNSF trackage is still using TWC-ABS operation with the brand new Darth Vaders. A smattering of searchlights are in service at some diamond crossings and movable bridges. Entering New Orleans both East Bridge Junction and West Bridge Junction interlocking towers are doing strong with no signs of re-signaling or closure being apparent. The Amtrak terminal has of course been resignaled for years, however the old Clara St tower is still standing. Well that's pretty much it. Not much to report, but I would have still liked to get a good photo set of things. I might try again next year since my subsequent day in NOLA was so fun ;-) Remember to check out Redoveryellow for 2008 photos taken before the route was completely sterilized.